Linus has his moments. He’s well-known for having a short-temper, lashing out at a contributor, but he is also known for creating Linux which a significant number of devices these days use, in some form or another. I work with it on a daily basis both at work and at home. Without this guy, I wouldn’t be where I am now. Well, possibly I would still be here, but dealing with cough Windows cough servers instead…. 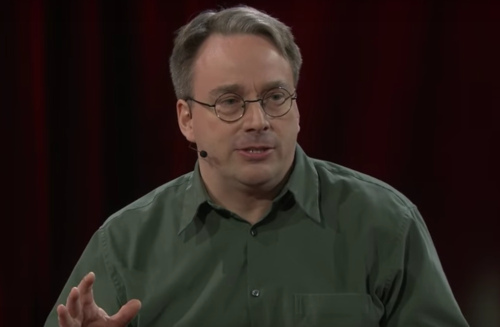 On August 25, Linux creator Linus Torvalds will be in a plane somewhere between Canada and the United States as his handiwork, which has completely changed the world of computing, marks its 25th birthday. Remember my previous post? It’s great seeing this happening – when people don’t care about winning and more about the race and finishing. The athlete who captured the essence of the Olympic spirit in a single act of selfless kindness is to be rewarded for her act of sportsmanship. It isn’t always about winning. And this isn’t the first time a runner was helped over the finish line. In 1992, Derek Redmond busted his hamstring mid-way and his dad came on to help him over the finish line. If you have played the original Pokemon games, you’ll know Abra was a headache to catch, using Teleport to escape at its first opportunity. The only way to stop this was to either catch him on your first go, or use a skill that would stop him using that move – such as one that induces sleep. My technique was to use a Great Ball (have picked up a ton of those recently) and curveball him. Managed to get a curveball + nice bonus this way. The Tower of London. A great tourist attraction. Great history…. and a bloody Magikarp nest. Still can’t complain, picked up a couple of Dratinis here (not enough to call it a Dratini nest) and also picked up the infamous Pikachu. Pikachu is the only Pokemon in the game that I have encountered so far that actually uses a voice rather than computer-generated screeches and squeals for its signature call. You’ve probably seen articles inducing panic around the number of android devices vulnerable to this Quadrooter bug. But read through the below first. Another day, another overblown Android security scare. Who’s ready for a reality check? “Without an advanced mobile threat detection and mitigation solution on the Android device, there is little chance a user would suspect any malicious behavior has taken place,” the company says in its panic-inducing press release. Well, crikey: Only an advanced mobile threat detection and mitigation solution can stop this? Wait — like the one Check Point itself conveniently sells as a core part of its business? Hmm…that sure seems awfully coincidental. TL;DR: A “mobile threat detection and mitigration solution” is already present on practically all of those 900 million Android devices. It’s a native part of the Android operating system called Verify Apps, and it’s been present in the software since 2012….. Android has had its own built-in multilayered security system for ages now. There’s the threat-scanning Verify Apps system we were just discussing. The operating system also automatically monitors for signs of SMS-based scams, and the Chrome Android browser keeps an eye out for any Web-based boogeymen. “You win or you lose. Gold is all that matters,” he said. Just can’t get excited by Silver & Bronze medals. You win or you lose. His comment didn’t go well with some, notably English swimmer Chris Walker-Hebborn, who competed at the 2012 Olympics and in Rio this year. If you want to flame him, be my guest.